With more than 40,000 units of blood needed each and every day, blood banks play a critical role in saving lives and helping hospitals deliver quality patient care. There is no room for error or time to slow down. Match the right patient to the right blood with PDC Healthcare's comprehensive line of Blood Bands and Forms. These blood transfusion solutions are specially designed to provide positive identification and accuracy, help streamline processes, reduce labor, and prevent processing errors. 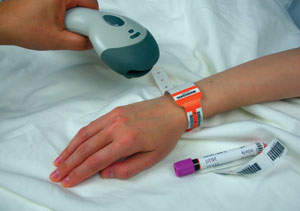 Securline® Bar Code Blood Bands ensure maximum safety throughout the blood transfusion process. Choose from a variety of styles that feature both bar code and serialized alpha-numeric codes to accurately match the right patient to the right blood. It provides unrivaled scanability, safety, and security! Securline® Blood Band and Blood Band Plus features 23 easy-peel labels and a tamper-proof SecurSnap® closure for maximum safety, comfort, and security. The Securlink® Blood Recipient System links the patient, the transfused blood, and all the related paperwork to assure a safe and complete blood transfusion. Ident-A™ Blood Recipient System efficient blood recipient patient ID system features non-transferable, moisture-resistant wristbands with pre-numbered insert cards and label sheets, cross-match reports, and requisition forms. Our Blood Bank Wristbands meet applicable National Patient Safety Goals of The Joint Commission and other regulatory guidelines. For more information, see our Patient Safety page.